Welcome to the four hundred and fifty-third of my blog interviews with novelists, poets, short story authors, biographers, agents, publishers and more. Today’s is with murder mystery and children’s author and playwright Deborah Nicholson. A list of interviewees (blogged and scheduled) can be found here. If you like what you read, please do go and investigate further. Deborah: My name is Deborah Nicholson and I’m from Calgary (in the gorgeous foothills of the Rocky Mountains in Canada). The truth is I’ve always been a writer. I don’t remember a time in my life when I wasn’t writing stories. I actually finished my first full length novel in 1994 and persevered for ten years until it was finally published (by a UK Publisher by the way!). Morgen: Woo hoo! Congratulations. 🙂 What genre do you generally write and have you considered other genres? Deborah: I generally write murder mysteries. I was the manager of a theatre in Calgary, and after I left, I decided it would be a fun place to set a mystery series. However, I have just published my first children’s story (which has also been performed as a children’s symphony with the Calgary Philharmonic Orchestra), and I have a play produced and I’ve written a book about losing weight – as I’ve spent the past five years of my life learning how to be a lighter and healthier person and shedding 140 pounds (which I think is ten stone to you, right?). Morgen: Spot on… wow. What have you had published to-date? Do you write under a pseudonym? Deborah: I publish under my own name. I always joked that I’ve worked this hard, I want people to know it’s me! My most recent books are: Stop Lying, the truth about weight loss (but you’re not going to like it) and The Adventures of Charlie the Cello. Deborah: I’ve had hundreds of rejections. You read them, decide if there’s anything useful (if were you lucky enough to get a critique), edit if needed, and then carry on. Getting a book published is hard work, because you have to find the right editor or agent in the right place at the right time, as well as having a good manuscript. Morgen: Exactly. Have you won or been shortlisted in any competitions? Deborah: I actually won the Pain Awareness Award for my play, The Pain Diaries: a love story. Morgen: ‘Pain Awareness Award’ is a new one to me so I’ve just Googled it (http://www.canadianpainsociety.ca/AwardsGrants/Pain_Awareness_Award_2012.pdf). Do you have an agent? Do you think they’re vital to an author’s success? Deborah: I had an agent and she retired. I’m currently looking for another. The publishing world is changing, but I still think you have greater access to publishers and editors with an agent than without. Morgen: Top ones certainly. Are your books available as eBooks? Were you involved in that process at all? Do you read eBooks or is it paper all the way? Deborah: My books are available as eBooks. As a matter of fact, I was totally involved in that process. When I got the rights back to my books, I e-published on my own. I read about half and half eBooks and paper books. I love the feel of a “real” book, but I love being able to carry hundreds of books around with me in an eReader. Morgen: Isn’t that great (411 on mine, and adding all the time). How much of the marketing do you do for your published works or indeed for yourself as a ‘brand’? Deborah: These days you do a lot of your own marketing. Publishers don’t give you a lot in the way of marketing, you kind of have to prove you’ve got the get up and go and develop some sales figures before they’ll invest more in you. Morgen: And most don’t have anything to invest, although us doing our own marketing means speaking to our readers directly which is always a bonus. Do you have a favourite of your books or characters? If any of your books were made into films, who would you have as the leading actor/s? Deborah: Books are like children, you love them all differently but equally. I’ll always have a soft spot for my first born, but I can’t choose just one. Morgen: Many authors can’t and have two early favourites but have since written some newer favourites. 🙂 Did you have any say in the titles / covers of your books? How important do you think they are? Deborah: My publisher always asked for ideas. When we disagreed, however, they cast the deciding vote. Morgen: As would be the way and I guess you just hope they know their audience. What are you working on at the moment / next? Deborah: At the moment I’m working on the sixth in my murder mystery series, the second in my Charlie the Cello series, and possibly a one-act play. I’m also thinking about doing a book on Calgary actors and their lives. Deborah: I don’t believe in writer’s block. I write every day – sometimes it’s better than others. The more you write, the more you exercise that part of your brain and the more creative you become. Morgen: Absolutely, like anything it’s all about practice. Do you plot your stories or do you just get an idea and run with it? Deborah: I usually write the first 60 pages, and then I write the ending. Sometimes, I know where the middle is going and sometimes I am very surprised at what ends up happening. Morgen: That’s my favourite part. Do you have a method for creating your characters, their names and what do you think makes them believable? Deborah: I find names really difficult. I have a baby book for names. Sometimes I search other languages for the words for characteristics of a character to see if that might make a good name. To make them believable, I just try and put bits and pieces of real people’s characteristics and quirks into a new package. You have to keep it toned down a bit though, real life is usually much too big for a fictional novel. Morgen: Sadly so. I had a couple of bad reviews for my free eShort Feeding the Father on Goodreads which is based on a true story – it’s pretty dark so I’m hoping the feedback’s just because of the content rather than my writing. 🙂 Do you write any poetry? Deborah: No, I am not a poet. Morgen: Me neither but then I’ve never been taught it… or read it, so that doesn’t help. Do you write any non-fiction or short stories? Deborah: My only foray into non-fiction is the book about my weight loss. I’ve written my story with my psychologist friend, Dr. Arlene Cox, and I dietitian I work with, Kelly Sullivan. It’s hard to reveal a lot of personal things about yourself and this book was quite an exercise for me. I have one short story published to date. Deborah: Anyone that tells you they don’t have to edit is a crazy liar! I edit all the time. I edit as I write, I edit through several drafts, and then I edit with an editor. I don’t care how good a writer you are, no one can turn out a perfect manuscript without working on it. And I believe writers are too close to their own story to really be the final say – all we see are trees, not the forest. Morgen: They are, absolutely. Which is why you have to leave everything for at least a week (says she who writes a story a day and put it onto her blog pretty much as it comes out). 🙂 Do you have to do much research? Deborah: Research depends on the project. My murder mysteries don’t require a lot. For my play, I spent about three years doing interviews with people. For the Charlie the Cello series, I spent three months with a cellist learning all about the cello and playing in an orchestra. For Stop Lying, I spent a couple of years reading blogs, trying to understand what people were getting stuck on with their own weight loss journeys. Deborah: I find point of view depends on the story. It seems to tell me what it wants to be. My mysteries are all first person, the rest are third. I have never tried second. It scares me! Morgen: It’s not that scary… I love it, actually – take a look at https://morgenbailey.wordpress.com/2ppov and see how you get on… maybe for your second published short story? Um… that’s if you find an editor willing to take second person. 😦 Do you have pieces of work that you think will never see light of day? Deborah: I’ve got a pretty schmaltzy romance-style novel that will probably live forever in my closet. Morgen: I had to write a romance as one of the Story a Day May 2012 pieces and was dreading it (although only being given the prompt in the morning didn’t give me much time to dread it) but now it’s one of my favourite, and longest, pieces (1966 and all that). What’s your favourite / least favourite aspect of your writing life? Has anything surprised you? Deborah: I love the actual writing. It feeds my soul. I love getting feedback from people – good or bad – it helps me define my message. And when they “get it” it’s joyful. What’s surprised me most is how little support you actually get from publishers. How things like book launches are usually organized by the authors (and usually paid for, as well). It also surprised me that best-seller lists are not a real sampling of what is selling, because they are from a very small sample of the population, and can be easily manipulated by publishers and authors. And it saddens me that contest winners carry so much weight – because judging writing is very subjective. I think a lot of really good books get over-looked because of this. On the other hand, anything that generates reading of any sort isn’t all bad. Morgen: Absolutely and I think more people are reading than ever before… and probably writing than ever thanks to eBooks. What advice would you give aspiring writers? Deborah: Only became a writer if you HAVE to write. If you can live without writing, then you will never survive the rejection or have the fortitude required to become at all successful. It requires a massive amount of dedication and self discipline. Morgen: It does, and fortunately I have it in spades… hence posting six items on two blogs a day. 🙂 If you could invite three people from any era to dinner, who would you choose and what would you cook (or hide the takeaway containers)? Morgen: all three I’d say 🙂 Is there a word, phrase or quote you like? Deborah: Life’s short, jump in the puddles. Morgen: I love that. Act your shoe size, not your age. Are you involved in anything else writing-related other than actual writing or marketing of your writing? Deborah: I’ve been involved with some writing groups, but the truth is I have to be selfish with my time, as I work a day job and write – there’s not many hours left to go around. Morgen: I think you have to be. I quit my job in March to get my novels online and they’re still not – in fact only one is close to it. I don’t want to cut back on the blog but it’s taking literally all the time I have (full-time and then some) because of all the emails (100+ a day) and whilst I don’t like keeping people waiting (although I have to already) I’m going to have to proportion my time better. What do you do when you’re not writing? Deborah: I enjoy friends. Writing is solitary, so I like to get out with people. Walks, hikes, lunches / dinners, cards or board games, BBQs. I even have a knitting / coffee group I belong to. I also love theatre and movies. Morgen: I do have a season ticket for the local cinema and my lodger and I go twice a week – the only time I sit and do nothing. Are there any writing-related websites and / or books that you find useful? Deborah: I’m a true extrovert. I don’t do as well online as I do with real live people. I feed off that energy. Deborah: Again, my networking is done through my local arts community. Morgen: I’d say that definitely beats sitting in front of a screen all day (as I do) and I have two writers’ conferences to look forward to in the next month… one on my birthday. 🙂 What do you think the future holds for a writer? Deborah: The future – that’s a hard question right now. The industry is in a flux, with eBooks surpassing sales of regular books, bookstores changing their designs and authors having a bit more control of their work. It’s early stages and I have no idea how it’s going to end up. What about you – any guesses or predictions? Morgen: Authors definitely are having more control (hoorah!) and I heard only this morning that Amazon are selling more eBooks than pBooks and am not surprised. As you said earlier it’s great having so many accessible wherever we go. Writers are struggling for their voices to be heard (which I guess is why I’ve had over 1,000 wanting to be interviewed!) but do think that the reviews will have their say… which means I need to do some work with my Goodreads ones. 🙂 Where can we find out about you and your work? Deborah: My website will link you to anything you need to find (including individual websites for my other projects) www.deborahnicholson.com. Deborah: I think this must be so fascinating, to find out about other writers. How do you find the time? Morgen: <laughs> by letting it take over my life. 🙂 Thank you, Deborah. Have you ever thought “If I could just lose this weight, I’d be so happy!”? What’s interesting to me now is I wonder whatever made me think that thin people were automatically happy? Or that all my problems stemmed from losing weight? Everyone has problems. Some of us use food to hide our problems, some of us use drugs or alcohol, some people cut themselves, some people use exercise and some people just hate themselves and struggle with self esteem. The funny thing is that both fat and thin people can fit into any of the above categories. Fat doesn’t always mean unhappy and certainly thin doesn’t always mean happy. All of the problems I had 140 pounds ago are still here. Still waiting to be dealt with. The difference is that now I’m dealing with them rather than hiding them below a pot of spaghetti. What makes it easier is that I have developed some better coping mechanisms. Are thin people always happy? Short answer: of course not. Body type doesn’t make anyone happy. Choosing to be happy, reframing your thoughts to the positive and reaching your goals will make you happy and feel powerful. Happiness is a day-to-day choice, not a dress size. 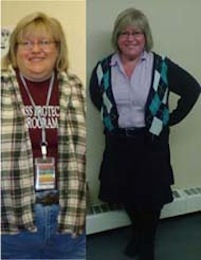 Author Deborah Nicholson has spent several years losing over 140 pounds and journalling all the way down. Together with psychologist Dr. Arlene Cox and registered dietitian Kelly Sullivan she has written Stop Lying as a way to reach out to others struggling with weight and food issues. ‘Stop Lying’ is a humorous and poignant self help manual that will lead you through self discovery, goal setting, with possibly a few tears along the way, to regaining control of your life. Deborah is the published author of the five successful novels in the Kate Carpenter Mystery Series, distributed in eight countries. Deborah has also done extensive work in creating and writing corporate websites, brochures and other promotional materials. Her first play, The Pain Diaries, for which she won the National Pain Awareness Award, was produced in 2010. Her new medical thriller, Mind Games, hit the shelves in summer 2011. Deborah has written two children’s series, The Magic Aprons and Charlie the Cello, the latter of which she adapted into a children’s concert with original music by the Calgary Philharmonic Orchestra’s principal cellist, Philip Hansen. Charlie made his stage debut in February 2012, with the CPO. Good interview! Really insightful. It’s interesting reading and (and speculating) on different authors’ opinions on poetry – I have friends who write, and also produce excellent poetry. I on the other hand haven’t the slightest of any poetic marrow in my bones!